Last year our sandwich, chips, fruit and yogurt game was strong... but after a sandwich boycott this summer I needed to figure out a way to step up our game. 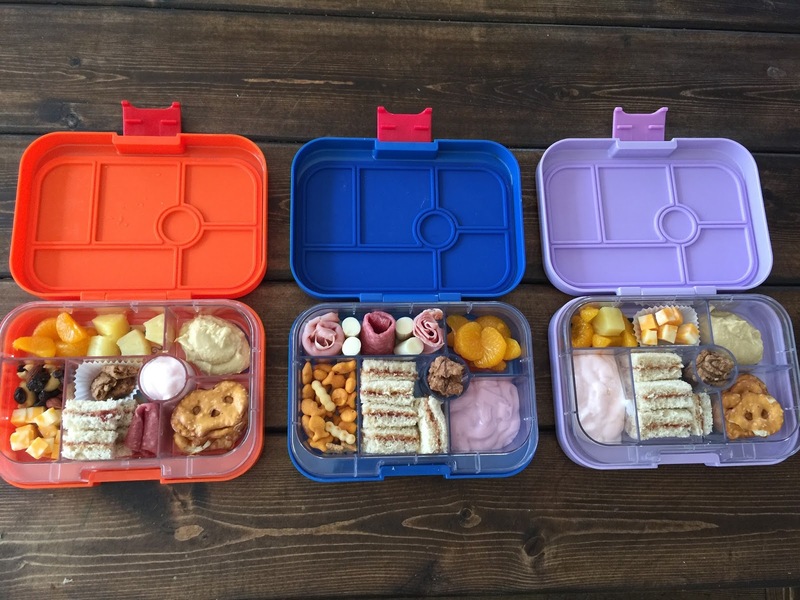 I ordered the boys Yumboxes and it has made lunches so much more fun and (believe it or not) easier. 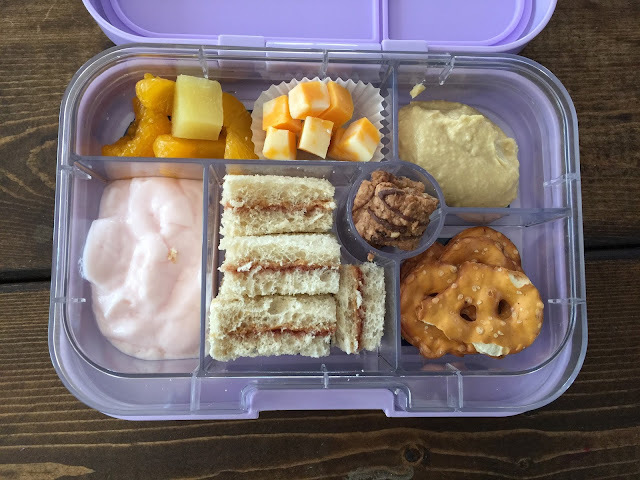 The Yumboxes are these refillable bento-style boxes, but the reason that I picked them over others is that the lid seals and you don't have to worry about the contents of the compartments mixing. They had great reviews and so I took the plunge and ordered them. It was love at first lunch and they have enabled me to keep up their "little bits of lots of things" style of eating and I feel like they're eating more of what I pack and enjoying their lunches more. 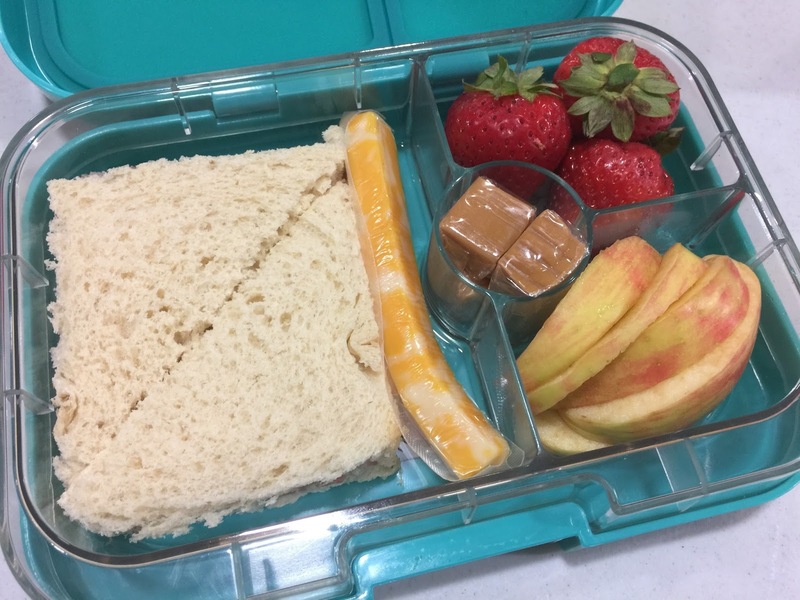 These are crummy pics, but here are a couple of their lunches just so you can see how much stuff you can really get in them! Luke had yogurt, salami and colby jack cheese, cold tortellini and marinara sauce for dipping (his FAVORITE! ), mandarin oranges and peanuts. Mason has yogurt, salami and cheese, PB & J sandwich, fruit snacks, oranges and blueberries and Chex Mix. We hadn't had the boys very long when we realized how convenient the boxes were for the car, lunch on the go, packing dinners and keeping them in the fridge for when I know we're going to have a busy night, etc. and so we ordered one for Griffin as well. 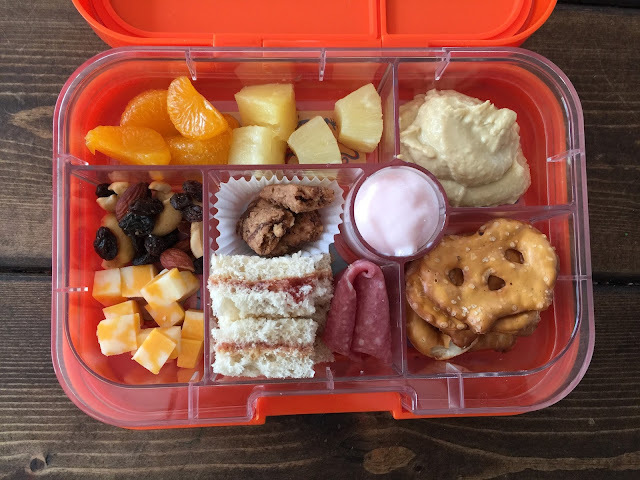 Luke: mandarin oranges, pineapple chunks, hummus and pretzel chips, yogurt, salami, peanut butter and jelly sandwich, protein bites, cheese, mixed nuts and raisins. Mason: Deli meat and cheese, mandarin oranges, yogurt, protein bites, peanut butter and jelly, goldfish mix. Griffin: Mandarin oranges and pineapple, cheese, hummus and pretzel chips, protein bites, PB&J sandwich and yogurt. Luke: Strawberries, ham and cheese tortilla rollups, gummy worms, pretzel chips and hummus (not pictured because we were out when I snapped these pics). I ordered a snack size one as well as the lunch and am OBSESSED! 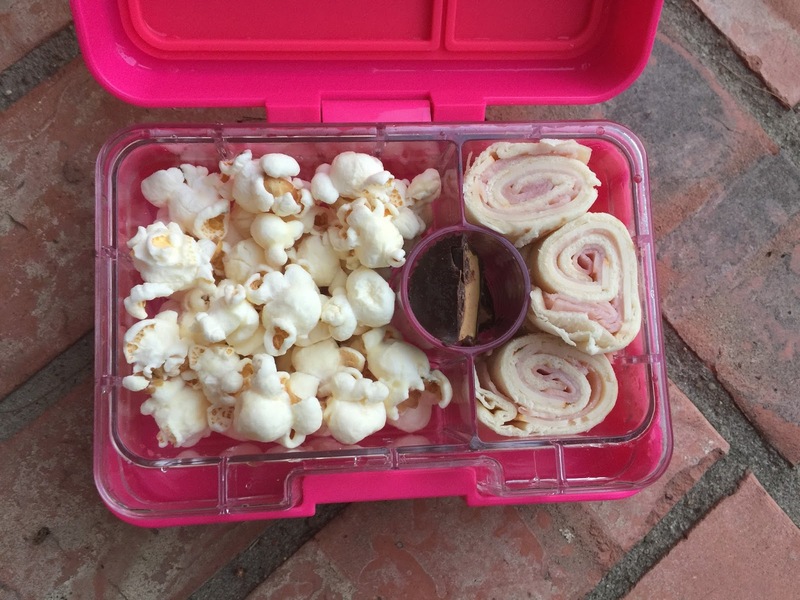 Another snack box is white cheddar SmartPop, a ham and Muenster cheese tortilla rollup and a Trader Joes dark chocolate peanut butter cup (cut in half to fit). And my lunch... PB&J, cheese, caramels (I really need to break this habit! ), strawberries and apple slices. I got the box with the bigger section instead of the multiple little sections. The boxes fit right inside the kids lunchboxes with room left over for their juice box, napkin, utensils, etc. and I use this lunchbox (it's only $12!) and both my regular size box and snack box fit in there with room for a water bottle. So far the kids haven't had a hard time keeping track of their boxes, but just in case I labeled them with my FAVORITE labels EVER!!! I use them on clothes, shoes, backpacks... EVERYTHING! You just write on them with a Sharpie, stick them on there and go. They go through the dishwasher, washing machine, etc. and they look as good as they did the day I stuck them on. - We've toted these boxes everywhere with all kinds of stuff in them (ranch dressing, marinara sauce, etc.) and NEVER had a leak. I know that you shouldn't put actual liquids in the compartments, but I'm not sure why you'd need to. - The boxes aren't insulated, but I store them in the refrigerator after I pack them at night and they stay pretty cool throughout the day. Since our lunch bags are insulated that keeps everything cool enough until lunch. - The inserts come out to make cleaning easy and everything CAN go on the top rack of the dishwasher, but we hand wash ours after school and let them dry so they're ready to pack after dinner. - Santa is bringing all three of the kids the snack size boxes in their stockings. 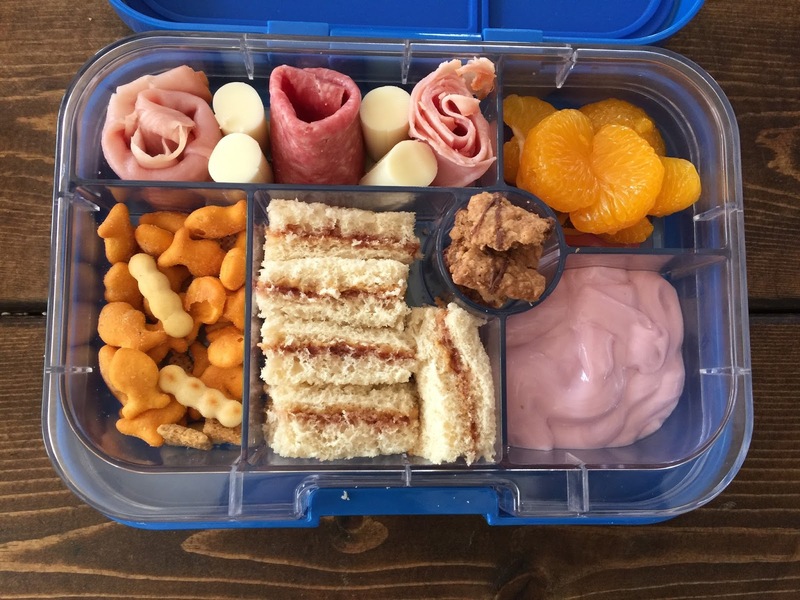 The boys each have to bring a snack to school in addition to their lunch and I think they'll be great for that as well as snacks for car trips, park dates, etc. We definitely don't do these every day... we have the occasional sandwich and chips lunch as well, but not as often. The boys don't really ever buy school lunch - we have a great catering program, but I can't bring myself to pay for lunch when I know they're only going to eat half of it. PS - This post contained affiliate links which means that if you clicked on a link and made a purchase I may receive a commission. THANK YOU!!! I loved this post! There are so many good ideas!! I always pack my kiddos stuff like this, but the boxes I use do mix sometimes. I am going to try one of these, thanks for sharing! I also loved all the ideas of different things to pack. 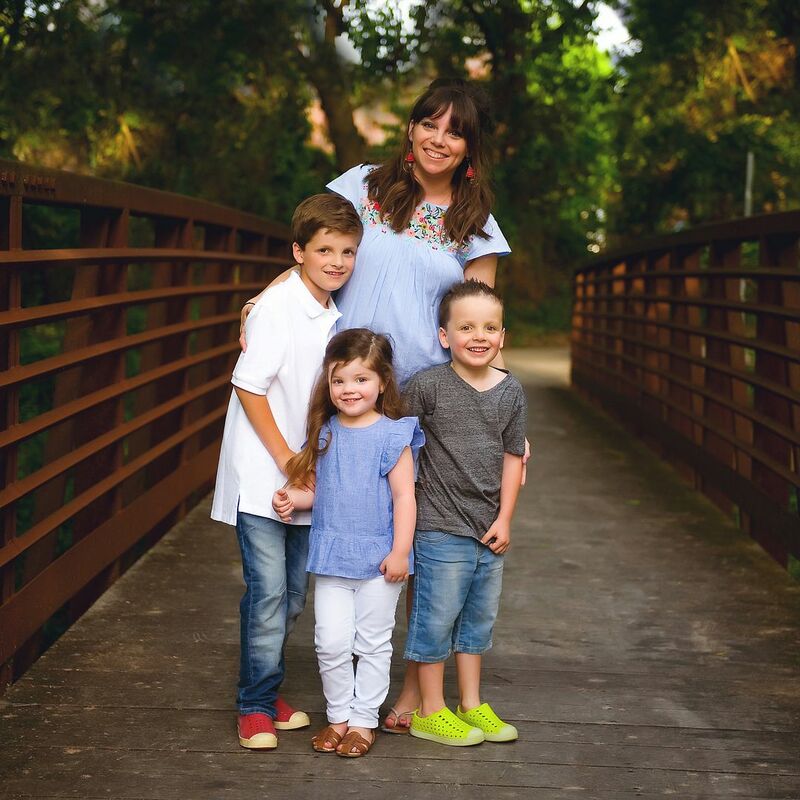 Since you mentioned stocking stuffers, I can't wait to see your post on gift and stocking ideas for your kiddos! I loved it last year, it helped a lot. Have a great day! Girl, I'm off to order these cute boxes! Lunchtime can be so boring, but those lunches look like so much fun! These boxes are great! Love them!! I pack my kiddos lunch everyday and we use a container box and the stuff spills over all the time! It is so frustrating, so I'm thinking Santa will need to add this to the list! 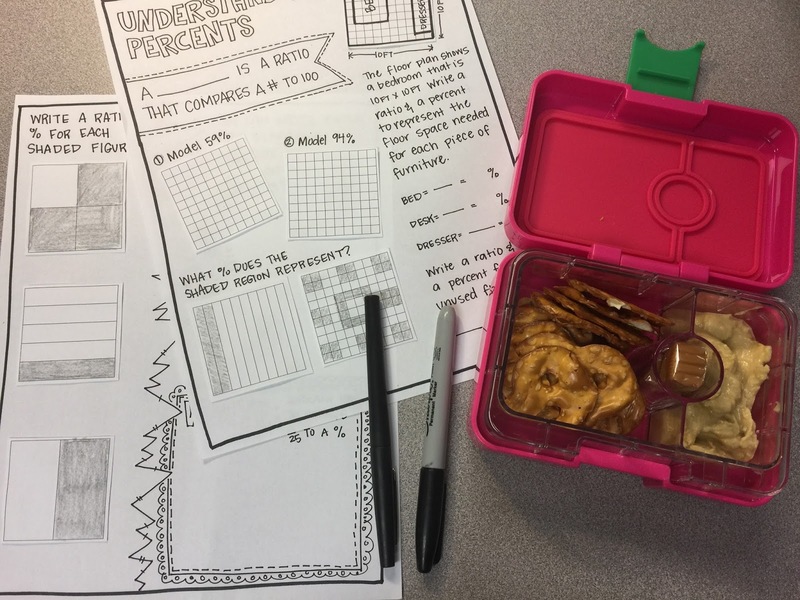 P.S.-love the lunch ideas! thanks! Those boxes are amazing!! I'm totally snagging some for my kiddos! 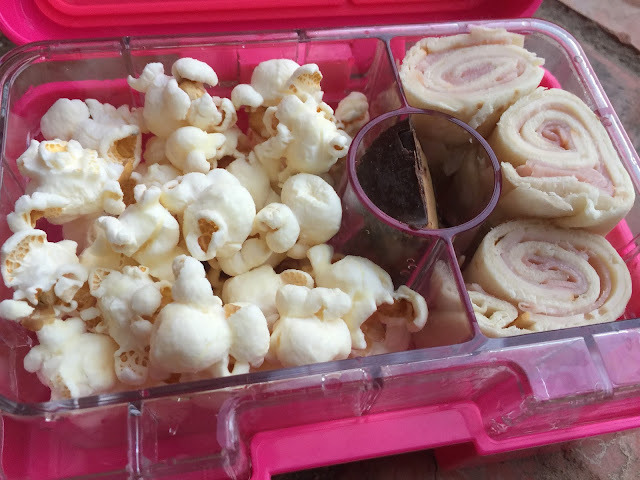 I use the Rubbermaid flexible ice blanket to keep my kids lunch cold. You can cut them down to the size you need! I love these. I have both sizes for my two yr old. He takes one to preschool for snack and the other one I take if we need a snack in the car. They are also great to take to restaurants. My son rarely will eat a meal so I don't like wasting the money and I just take a box with us. Love these boxes so much! What type of lunchbox do your kids use? Wondering if they will fit in the PBK ones. We have the FairFax PBK lunchbox and the Yumbox fits with room for juice, etc. I have these boxes for my daughters, and they fit in both the PBK lunch box (with an ice pack) and the Garnet Hill lunchbox (also with an ice pack). I second everything Andrea said, they are amazing, and I love not having to put all of their food in a bag or wrap it up in saran wrap. 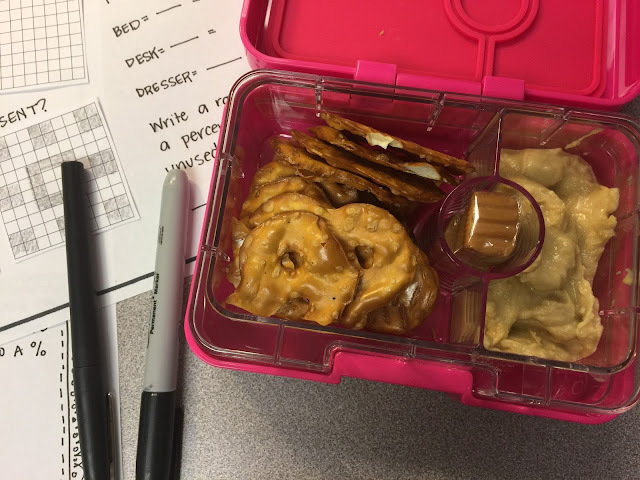 I am always on the look out for new lunch ideas for my kiddos. Thank you for sharing! Ok, I'm tempted to order these for myself after reading this. You could sell anything, Andrea! Great post! 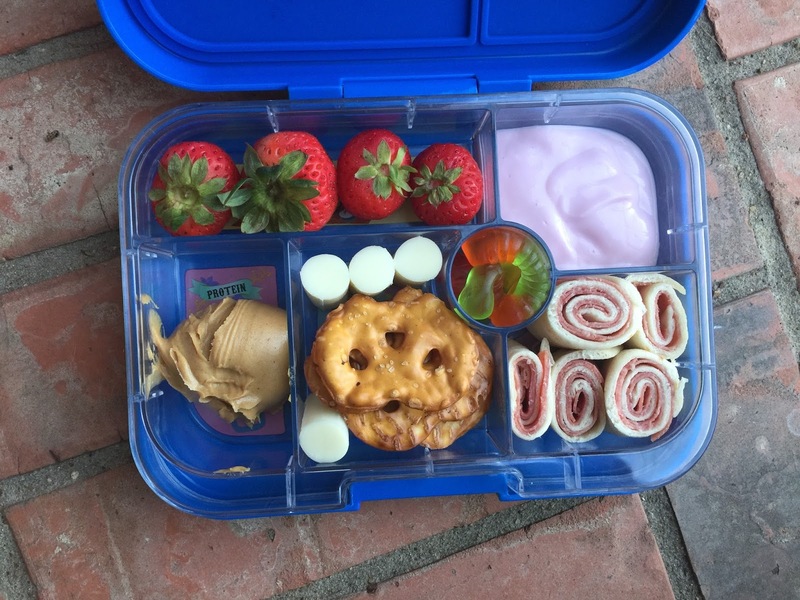 School lunches are hard but I really like this Yumbox idea- thanks!! I have absolutely no reason to need one of these but for some reason I want one! LOL! I wish they had had these when my kiddos were little. What great lunches! So do you pack the utensils in the lunch bag? I am loving these! These are great! I have some rubbermaid compartment boxes but I love that these don't leak! Okay, you've convinced me...I need the snack and lunchbox sizes for myself. Also, I need the cute lunch bag. Loved this post. You always make everything so fun and exciting! What great ideas!! I did a post last week on packing kids lunches! 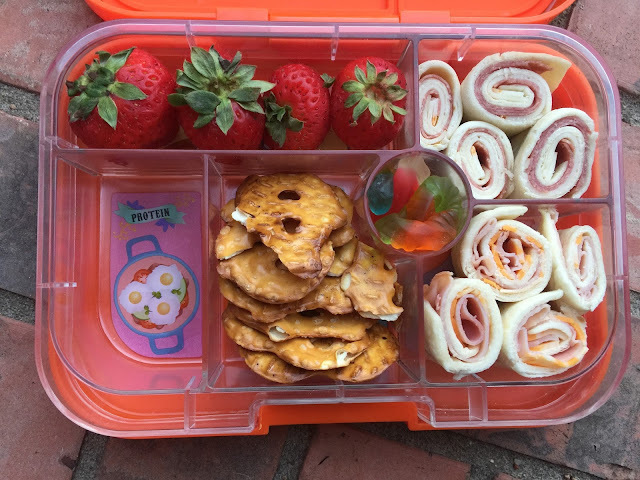 I can't find a homemade "Pizza lunchable" that I love for my daughter!! Thank you for sharing! Love this!! Thanks for the awesome review! What are the protein bites in the kid's lunches? Oh my gosh! This is such a GREAT idea. Thank you, Andrea!! I often struggle with what to pack for lunch on the go, as well. So many great ideas! I love this, Andrea! I might need to get some of these for Christmas!! Love these ideas! What are the protein bites? Do you make them or buy them? Love the ideas and thinking my 3 year old needs one of these! He has been needing a new lunch box as well. What type of lunch box do your boys have that these would fit in? So many items in this post that we need! Thanks for sharing! I am always looking for more ideas for easy lunches. My kids all eat little bits of lots of things too! I hope you will share periodically as you have new ideas! We often get in lunch ruts!